IQ Natural ‘Get Gorgeous’ selection is a unique mineral natural makeup kit that will help transform your face in minutes. This easy start minerals kit has everything you need to achieve a complexion that is beautiful while obtaining a natural flawless look. This makeup kit includes easy step by step application tips. 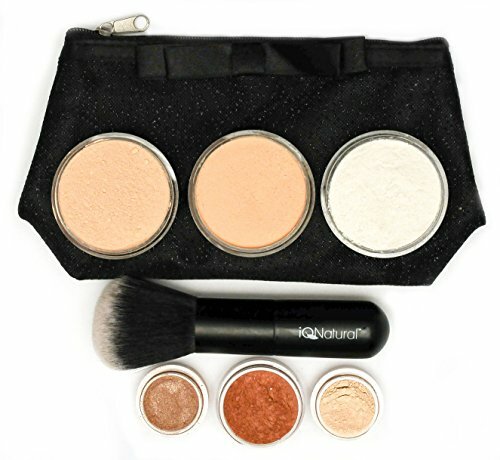 Tuxedo Makeup Bag, Flawless Kabuki Brush, Natural Mineral Makeup Kit includes, 2X Full Size Mineral Foundations 6g, Setting veil 6g, Bisque concealer 1.5g, Bronzer 3g, Eye shadows 1.5g. All Eye shadows, blush, and bronzer shades are pre-selected by our esthetician and natural makeup artist for the foundation color shade you select at checkout. Receive a Photo finish every time. A complete coverage foundation with a very natural look. Everything you need for a glamorous complexion with natural benefits. Will not cause irritated itching skin or acne. Light weight and suitable for all varieties of skin tones. Will not melt away, perfect for the Active and Sport Lifestyles. Great in humid and hot climates.